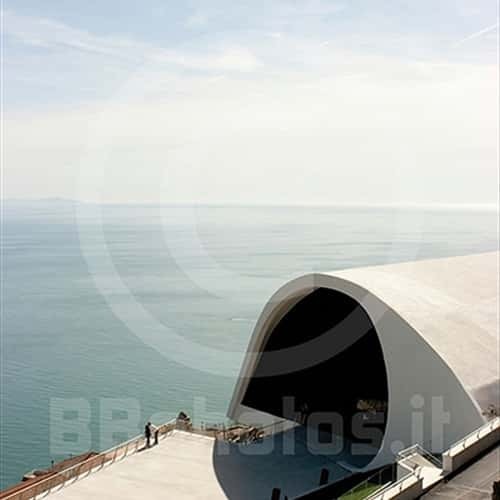 The auditorium of Ravello is set in a natural slope of the Amalfi Coast and, from a height of 365 meters above sea level, it enjoys a unique view of the Divine coastline. 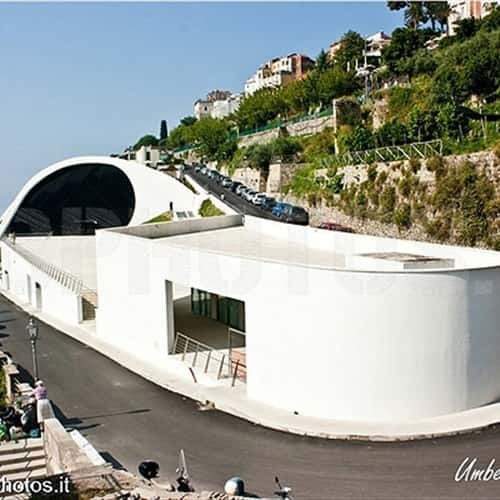 Although the "City of Music" features several beautiful outdoor venues (but with not more than a hundred seat capacity) to attend concerts, dance performances and plays, such as: Villa Rufolo, Villa Cimbrone, Piazza Duomo and Piazza San Giovanni del Toro, it felt the need to provide itself with a new structure, allowing it to extend the concert series all year round, and, secondly, allowing it to host a greater number of fans and admirers. 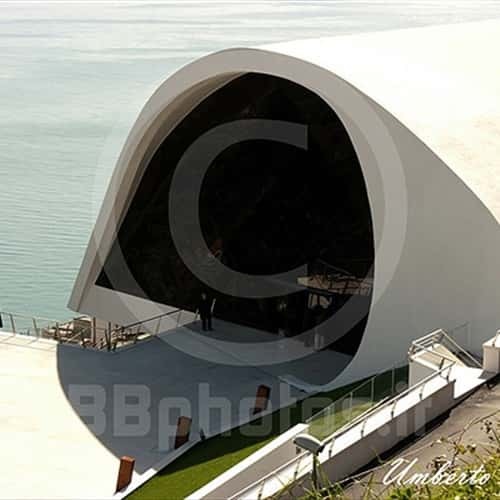 The project was assigned to the famous Brazilian architect Oscar Niemeyer, and delivered, along with a plastic, on September 23rd 2000, after more than seventy days of work. 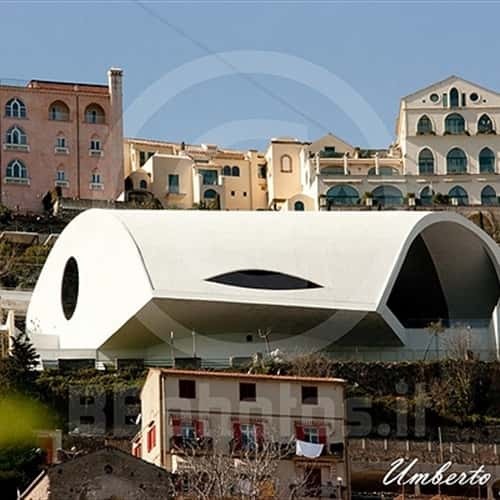 From the beginning, in fact, the architect found himself in front of problems related to natural unevenness of the terrain "... the uneven ground, narrow with a very strong transverse orientation. Hence the initiative to build a model." and more: " ... I did not think about an expensive operation, that could involve an unnatural development of the land, not needed, so I took as a starting point the exact inclination of the parterre and the project started to take its present shape". 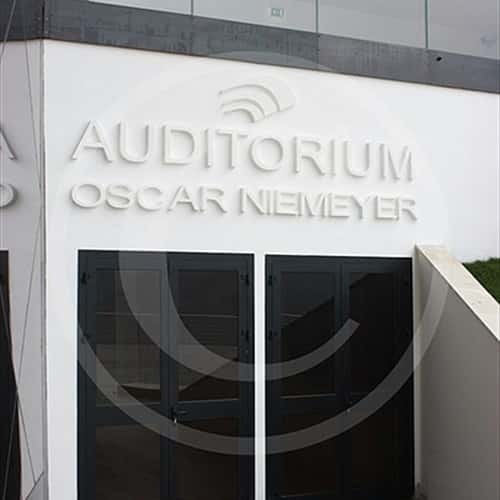 The Auditorium is accessed by an oblong square, which allows its visitors to enjoy, at the same time, the amazing landscape and the particular exterior of the building. 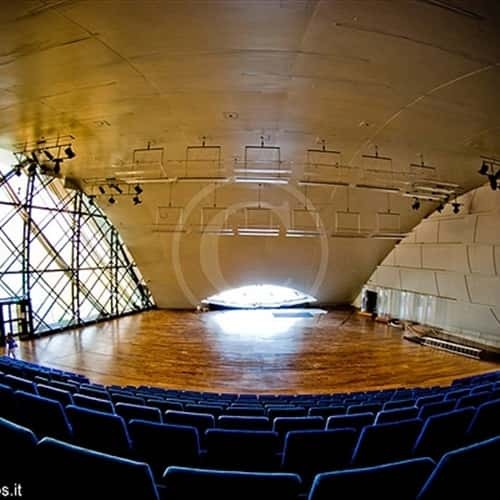 The main concert hall takes advantage of the natural slope of the land, while the orchestra stand and the foyer are projecting boldly into the void, like the spectacular stage of Villa Rufolo, but without a visible support. 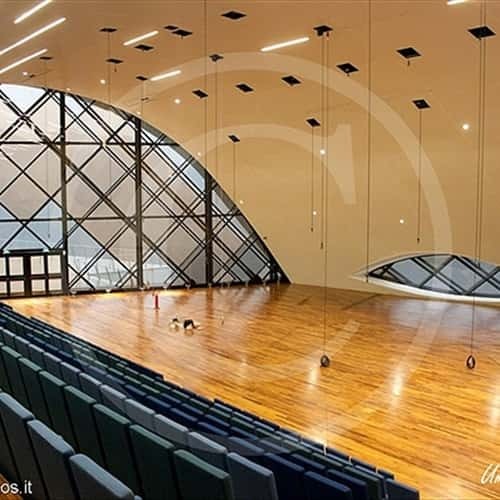 Perfection is ensured by the concave shaped building, similar to the perfect sounding board of a mandolin, and the landscape continues to be enjoyable thanks to the large access window and the large porthole located behind the orchestra.